North of Jenner, off the side of the beautiful Pacific Coast Hwy. is a large cove split in two by an island of schist spires. The island of rock is actually connected to the mainland by a narrow isthmus that is almost completely submerged in the ocean at high tide. Seals, birds and fish swim, fly, and float by in a constant show of mother nature’s glory. A good low tide boulder can be found in the south cove and a few problems with rocky landings can be found among the crags on the island but the best is the Isthmus Boulder, which is on the south side of the isthmus. Some of the rock is loose; a pad and spotter is highly recommended. The boulder problems at Twin Coves vary in difficulty from 5.6-V4. 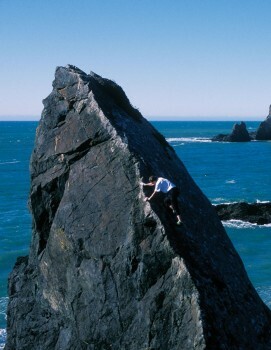 There are also good sport climbs on the “island” ranging from 5.6-5.10. Solo Arête 5.6X, Twin Coves Traverse V3, Isthmus Boulder V0-V3. Which SuperTopo guidebooks cover Twin Coves? Mark Howe on his classic Solo Arête 5.6X.